The Waters Edge Lighthouse offers patio dining, banquet facilities, and lodging on the Mohawk River in Schenectady, NY. With only a handful of reservations and Mother’s Day just around the corner, Waters Edge feared they might not do their usual scale for the annual Mother’s Day Brunch. 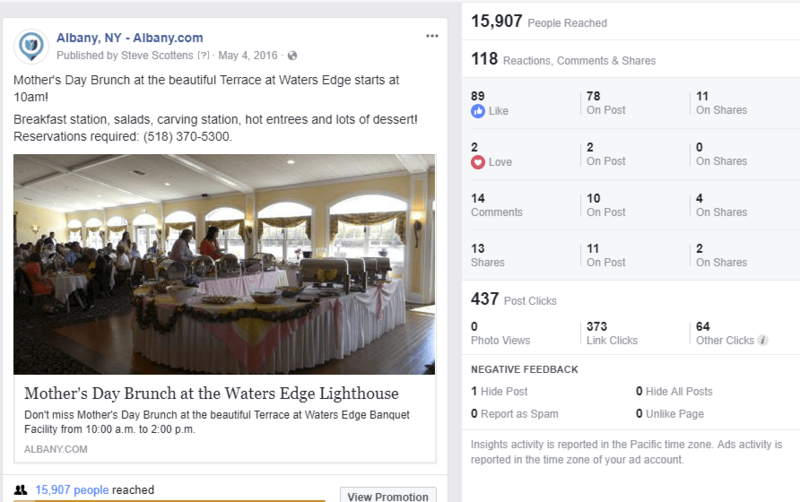 They needed a local online advertising program to keep regulars coming in to the restaurant, fill banquet spaces, and get new customers in the door. One simple Facebook Post fills the restaurant on Mother’s Day. Albany.com is an influencer in upstate NY, so we used their Facebook Page to remind locals about this amazing restaurant for Mother’s Day. Within one week of running the promotion, their banquet hall was filled to capacity! Their ad reached nearly 16,000 people on Facebook and people were calling the restaurant in direct response to the ad they saw on Facebook. In fact, so many people responded to this campaign that Waters Edge hit full capacity and had to turn dozens of people away. Do you want to advertise and promote your business, services, or special events in Albany NY and the surrounding area? Contact Mannix Marketing today to learn how we can help!